Check your local pub or galley for tour info. I've been set to task on reviewing an album by The Decemberists, a band whose name has floated by my ears a few times over the years, but I never really knew what they were about. The Decemberists are an indie folk rock group hailing from Portland, Oregon. 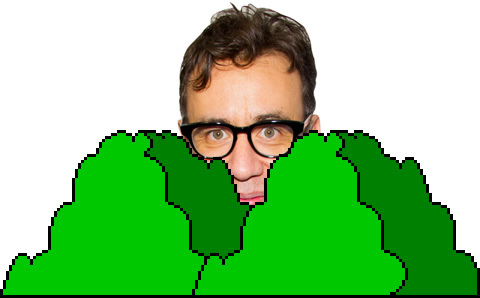 Gee, I sure hope Fred Armisen doesn't come popping out of the bushes. They sing a fair amount about historical events, real or otherwise; to some, this is probably a relief from the usual radio-friendly tale of carnival bliss or bathroom breakups. Suddenly, an album falls into my lap! What do I do? 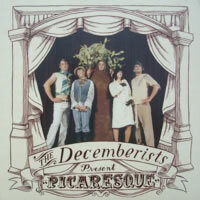 This is "Picaresque", the only album I can think of off the top of my head that was apparently recorded in a church. It starts off with the cry of a saddened beast in The Infanta as the drums roll in. It's loud, it's in your face, and its non-stop barrage of dilettante rock and chipper beardly vocals is unapologetically designated for the stage of a lager-soaked tavern. The Decemberists want your attention, and they'll get it with energy and volume. We Both Go Down Together slows down a bit, but the mix of all things strings still delivers that rustic historic feel while lead vocalist Colin Meloy leads onward with the voice of a love-starved seaman. (Is that bizarre?) The slow pace is continued into Eli, The Barrow Boy, whose instrumental focus is on a single acoustic guitar and some mild accordion work while Meloy croons about a worker who couldn't afford to buy the finer things for his lost love. I'll say this: The Decemberists are very earthy. Just as I was ready to relax for a bit, The Sporting Life woke me up with max power and a kick to the behind thanks to its very vibrant, very contemporary drum beat. If I had to describe this song (and apparently, I do), I'd say it's one of the best candidates I've ever heard for hopping off the couch and spontaneously doing the Monkey. Yet The Bagman's Gambit then takes all that energy and puts it temporarily back in the bag in favour of another slow acoustic song (or at least it starts slow before extra guitars and harder beats hit the foreground) about a fugitive and his secret romance in various places, including an embassy and a mall bathroom, the worst place to do anything, including exist. I had heard that The Decemberists were a band mired in myths and history, but this subject matter seems far more modern than anticipated. Hmmm. Next is From My Own True Love (Lost At Sea), another tale of woe from a melancholy sailor. There aren't many lyrics here aside from Meloy (or the character he is portraying) awaiting a letter from someone who he hopes still lives but may very well be dead at the hands of the briny deep. The instrumentation is primarily acoustic guitar again, although other strings and the occasional chime share the spotlight. Sixteen Military Wives started to play next, and I swear I've heard this before. I would bet serious money that I've heard this upbeat little folk-poppy number before. But where, exactly? In any case, it's been directly proclaimed as an anti-Iraq War anthem; if all protest songs are like this, then maybe major issues would earn more notice! This track's by far the most accessible of the bunch. But there's too much pep here. We need to slow down again, and that's where The Engine Driver comes into play. Another song that sings heavily of love (a sad theme of many of these songs, and of music as a whole), this one chuffs along a bit more sluggishly than the last, but there's a certain air of romanticism floating through this song. Now it's time to go On The Bus Mall, whatever that means. Tossing in some extra piano and synthesizers to coordinate with the regular acoustic guitars, this tune has a fairy-like quality, drenched in a sweat of mid-90s alternative depressivity, similar to the hits of the time. ...Wait, what's a bus mall? Ah, no time for that! The cheeky accordions are calling with The Mariner's Revenge Song, an almost-nine-minute-long shanty that pretty much solidifies the notion that this band is obsessed with nautical workers as the tale of two mariners caught in a whale's belly gradually unfolds. Singer Meloy is joined by mandolin, tom drums, and some female vocals. Those who suckle off the sounds of seafaring instruments will definitely get a kick out of this basher, even though it does drag on longer than necessary without any significant reason to continue. The album then ends with Of Angels And Angles, perhaps the most lento song on the album, an acoustic cooldown covering all the key issues of life: love, death, and drowning in the sea. You know, regular stuff. I honestly think it would've been more climactic to end with The Mariner's Revenge Song, as this track now just feels unusually tacked on at the end. Ah geez, I knew it! Get outta here, Fred!